Blockchain.info is a longstanding Bitcoin and Ethereum Wallet and is one of the most used websites in the industry. The platform was launched in August 2011 and is based in Luxembourg. Blockchain.info also has a blockchain explorer that aims to help users understand the current status of Bitcoin including latest transactions and the number of transactions per day. 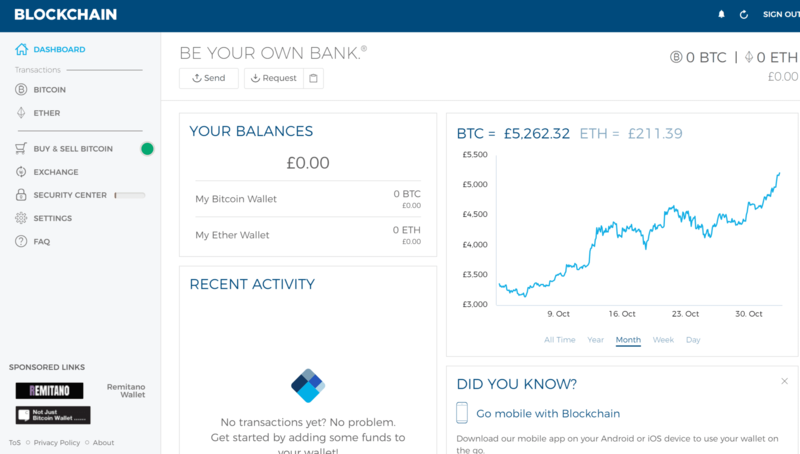 In this Blockchain.info wallet review, you’ll find out more about what the platform has to offer, the level of difficulty in using it, and ultimately whether it fits your needs. The Blockchain.info wallet is highly popular for a number of reasons. People love the easy-to-use layout, as well as the Blockchain.info’s positive reputation. However, there are also a few drawbacks to the service due to it being online. Blockchain.info is an established trusted company with years of experience and millions of users. Well-liked for small transactions and regular payments. Helpful to spend funds from a paper wallet. Easy and straightforward to use makes it appealing for new Bitcoin users. People like the smartphone app’s functionality. Experienced Bitcoin users don’t like the potential risks of an online hot wallet. There a few reports of accounts being emptied and stolen. There are claims that customer support is often unhelpful or completely elusive. People generally like the software when it comes to the functionality and day-to-day use. The major issue (if any) is the potentially lapses in security. Whether or not the users complaining that their wallets got hacked were taking adequate security measures isn’t known, but it’s worth noting that online wallets can be risky. Plus the customer support often ignores this complaint leaving users a little high and dry. It is recommended that the wallet should be used for lower transactions and holding large sums in the platform is not a wise idea. If you’re looking to hold larger quantities of Bitcoin, it’s recommended you use a hard wallet. Like many services, Blockchain.info has a fairly swift sign-up process. You only need to take a few steps and you’ll have access to your wallet. Simply input an email, choose a super strong password, and you’re ready to start receiving Bitcoin. The user interface is fairly intuitive upon opening with a small selection of tabs combined with a sticky “Send and Receive” menu at the top. Everything is clear and easy to understand for the layman. This is perfect if it is your first Bitcoin wallet. Your transaction data sits readily available directly near the blockchain explorer feature. This means monitoring all ingoings and outgoings is possible live, right from within the wallet. 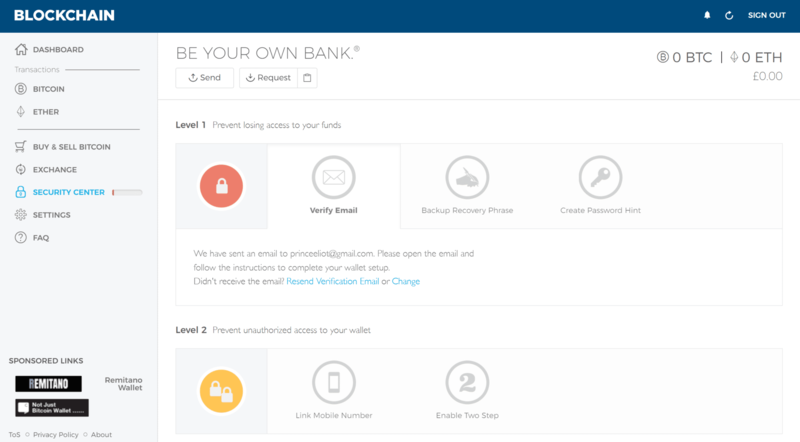 Security is highlighted with status bars, which will be defaulted to red upon your first login. This should be a nice green full color once you have worked your way through the security tab. There is nothing out of the ordinary in the way that it is presented. Everything is fluid and no additional downloads are necessary. It operates in the way a hot wallet should. The ideal wallet should be convenient for the accessing and trading funds, but more importantly, it should keep your tokens secure. The Blockchain.info security tab makes sure your defenses are bolstered up to prevent any potential threats or hacks. Running an account as without using the security features is pretty much like leaving a car unlocked in a big car park. Sure it might be ok for a while, but it’s a car park so car thieves are likely to be around. Eventually one of them will try the door handle and it will just pop right open. With a hot wallet, it’s always vital you are accessing the correct website. It is a good idea to bookmark https://blockchain.info or specifically types it in each time. Entering the site through Google or clicking an email that looks legit could just send you to a scam site waiting to phish your sensitive information. Make sure to double-check the web address before entering passwords. To start with, make sure you backup your recovery key. 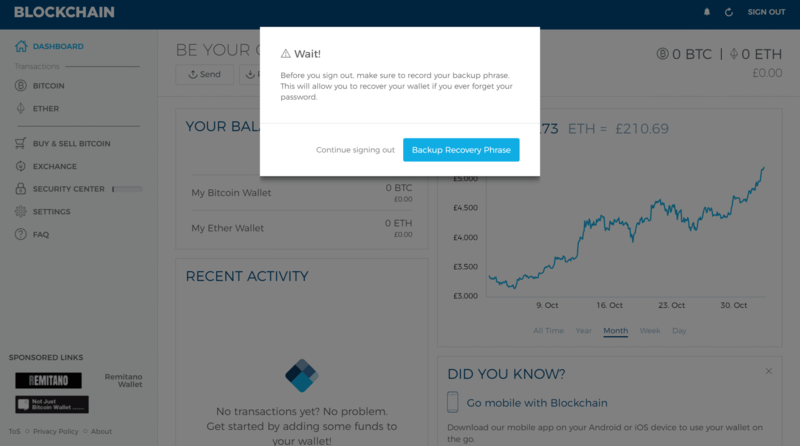 If your recovery is backed up, you’ll be able to get your Bitcoins back in the result of lost data or passwords. The recovery phrase is effectively a representation of your private key so keep safe and don’t ever put it into digital format. Opting for the simple pen and paper method is surprisingly secure (just don’t lose it!). The SMS and two-factor authentication is an expected step on any financial account these days, and Blockchain.info includes this choice. It will stop quick fingers from accessing your account with just an email address and password. There is a nice final feature which blocks Tor requests. When turned on it hardens your wallet against anonymous entities on the dark web. The Blockchain.info wallet is very easy to get started with. It provides lots of little features that smooth out any rough edges, making Bitcoin trading and usage simple to understand for the newcomer. The send function is very clear. 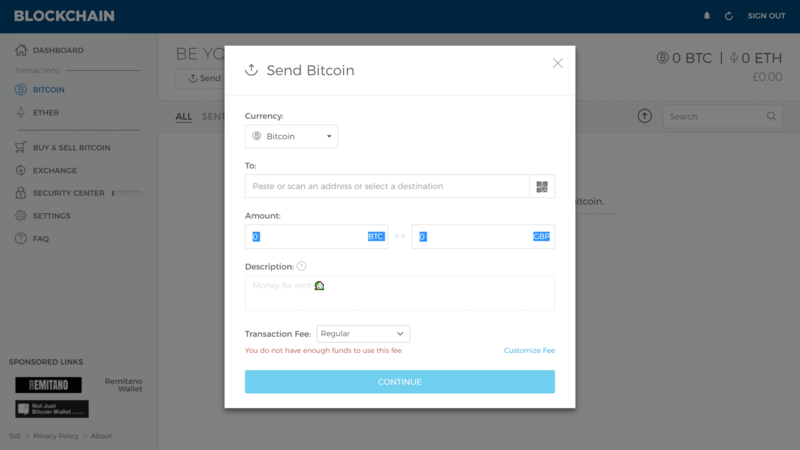 Simply select how much Bitcoin you want to send by inputting your local fiat amount and it will convert it via the current exchange rate. Converting Bitcoin to Ethereum is made painless via the exchange area, which helps stop any fiddly conversions or using outside services. These two features make it accessible for those who don’t want to be bothered with exchange rates and conversions. Smartphone wallet users will be pleasantly surprised with the quick pair function that authorizes the app on your phone. Simply scan the browser QR code and it will log you into the app. All you need to do is throw a pin code on and you’re away. Receiving funds through the browser was fine, although it took me a few seconds to find the public address QR code. I like them to be nice and primed for quick payments and no mistakes. This is certainly something that is important if we expect Bitcoin to be used more often in day-to-day life. One ideal little helper for new users is the popup that greets you on the first logout. It advises you to set your backup recovery key before you lose anything. This is particularly useful, even if it’s just a little reminder to slow down and take care. As far as hot wallets go, Blockchain.info is everything you could need with the usual features and slick simple performance. The wallet security should be good enough for small balances and transactions, but you’d probably sleep better at night storing your larger quantities in a hardware wallet. You do have to place some 3rd party trust into the company, which is not always welcomed by the Bitcoin community. Every wallet has its tradeoffs. However, Blockchain.info is a fast functional wallet that is quick to setup and easy to use, making it one of the best online wallets on the market. This article Eliot Prince was originally posted on Coincentral.com and has been republished here with permission.